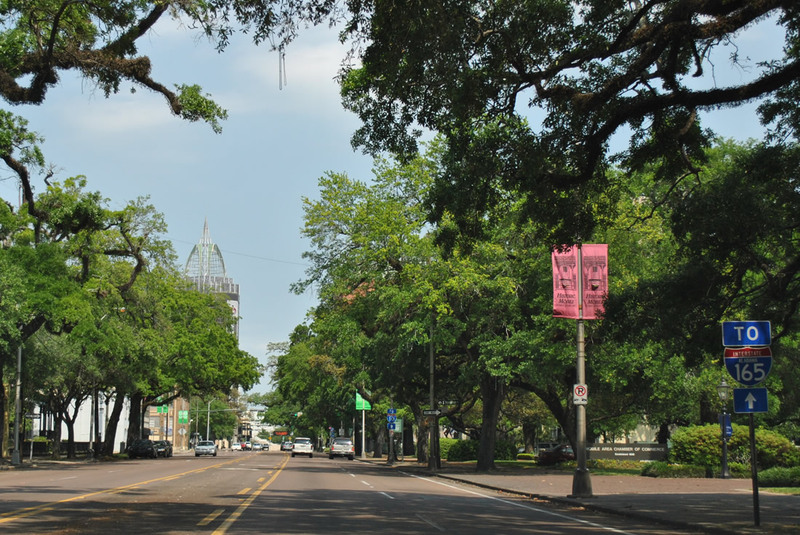 Interstate 165 travels near Downtown Prichard into the northern reaches of Downtown Mobile. Opened to traffic on October 28, 19941, Interstate 165 provides access from Downtown Mobile to Prichard and Interstate 65 near Chickasaw. Costing $240 million to build,2 the freeway serves the Alabama State Docks along the Mobile River at its south end while also linking with the Henry Aaron Loop in Mobile. Overall carrying six lanes, the highway is elevated for approximately four miles. Overhead lighting assemblies line the 4.90-mile freeway for its entire length. Interstate 165 was created in place of the canceled Interstate 210 proposal. 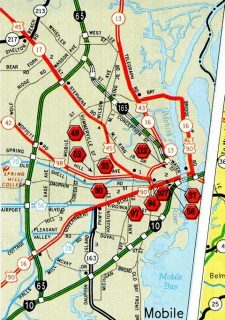 Interstate 210, with origins dating back to 1958, was the missing link in the Mobile Urban Interstate system between Interstate 65 and Interstate 10. 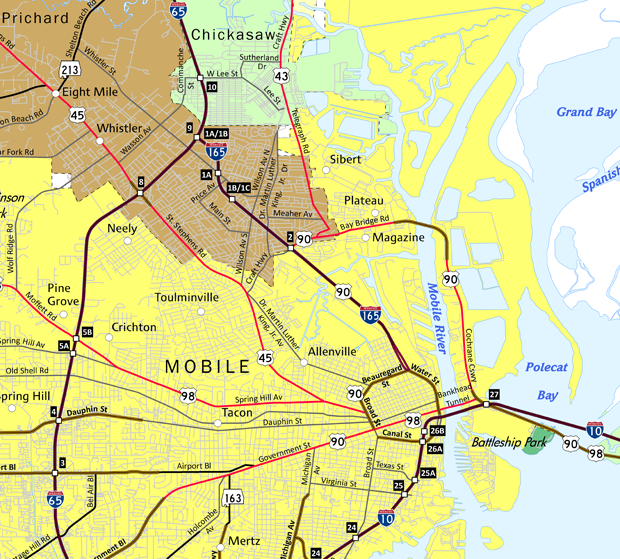 Due to the impact on the Downtown Mobile area and access to the Mobile River waterfront, it was decided to curtail the southernmost reaches of Interstate 210 in favor of a spur routing of the freeway between Interstate 65 and Beauregard Street. 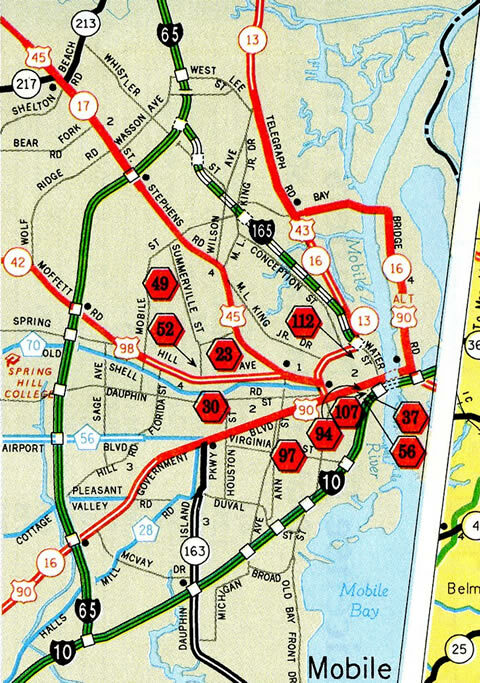 Since I-210 no longer connected two Interstates or connected to I-10, the planned freeway was renumbered as the spur designation I-165. AASHTO approved the elimination of Interstate 210 and the designation of Interstate 165 from an application by the state of Alabama on June 7, 1989. Interstate 165 between the south end and Exit 2 (Bay Bridge Road) overlaps with U.S. 90 and Truck U.S. 98. U.S. 90 used to travel through Downtown Mobile in conjunction with U.S. 98, but was rerouted onto Truck U.S. 90-98 over the Cochrane-Africatown Bridge and Bay Bridge Road in 1999. Interstate 165 and Truck U.S. 98 provide a mandatory bypass of the Bankhead (U.S. 98) and Wallace Tunnels (Interstate 10) under the Mobile River for hazardous material based cargo. The Cochrane Bridge also provides an alternate route for traffic between Interstates 10 and 65 away from Downtown Mobile. The interchange box displayed at the south end of I-165 on the Alabama state map is erroneous. As such the Rand McNally North American Road Atlas also displays an ICBox at the south end of I-165. Trailblazers for Interstate 165 are posted throughout the Mobile central business district directing traffic onto Water Street northbound. Photo taken 04/11/12. Nearing the Wilson Avenue on-ramp, a diagrammatic sign outlines the forthcoming partition for Interstate 65. Photo taken 11/23/14. Leaving the central Prichard area and the Whistler Street on-ramp, Interstate 165 expands to four lanes ahead of the ramp split (Exits 1A/B) to Interstate 65. Three lanes carry motorists onto I-65 south ahead of U.S. 45 (St. Stephens Road). Photo taken 11/23/14. Interstate 165 concludes at I-65 just south of the Chickasaw city line. Motorists continuing northward along I-65 travel to Saraland and Satsuma on the 160-mile drive to Montgomery. Photo taken 11/23/14. See the Interstate 165 highway guide for more photos from this perspective. The first guide sign for Interstate 165 (Exit 9) precedes the six-ramp parclo interchange (Exit 8) with U.S. 45 (St. Stephens Road). Photo taken 11/22/08. An auxiliary lane opens along Interstate 65 north for I-165 south at Exit 9. I-165 provides part of a commuter route to Downtown Mobile from west Mobile. Photo taken 11/21/08. Interstate 65 northbound enters the directional T interchange (Exit 9) with I-165 south into Prichard. Photo taken 10/10/11. See the Interstate 65 Northbound – Mobile County highway guide for additional photos from this perspective. The first sign posted for Interstate 165 appears just south of the exchange with Alabama 158/213. Interstate 65 widens to six lanes southward through Chickasabogue Park, Chickasaw and the split with I-165. Photo taken 11/20/15. A diamond interchange (Exit 10) joins I-65 with West Lee Street in Chickasaw three quarters of a mile north of the separation with Interstate 165. Photo taken 11/20/15. The entrance ramp from West Lee Street adds a fourth southbound lane along I-65 to Exit 9 for Interstate 165. Photo taken 11/20/15. Interstate 165 branches southeast from I-65 through Prichard to Downtown Mobile. Trailblazers and guide signs posted along the freeway are part of the ALDOT preferred for U.S. 98 between Semmes and the Baldwin County beaches via I-165 and Bay Bridge Road (U.S. 90). Photo taken 11/20/15. See the Interstate 65 Southbound – Mobile County highway guide for more photos from this perspective. An end sign precedes the conclusion of Interstate 165 south by one mile as the freeway viaduct elevates over the State Docks Railroad line. Photo taken 11/25/14. Interstate 165 ends at the intersection of Beauregard and Waters Street next to the GM&O Transportation Center. The left-hand lane connects with Beauregard Street east to Delchamps Drive and the Alabama State Docks. Photo taken 11/25/14. The viaduct separates and the speed limit reduces as Interstate 165 lowers toward Water Street. An on-ramp enters from the left that once carried U.S. 43 from Telegraph Road onto Beauregard Street west. Photo taken 11/25/14. Conception Street Road ties in from the right, bringing the south end of Interstate 165 to six lanes. Water Street begins ahead and comprises a six-lane boulevard to the central business district and Interstate 10. U.S. 90 west follows Beauregard Street to Broad Street south, where it meets U.S. 98 at Spring Hill Avenue. Photo taken 11/25/14. See the Interstate 165 highway guide for additional photos of southbound. Water Street northbound approaches the signalized intersection with Beauregard Street and northbound beginning of Interstate 165. U.S. 90 follows Beauregard Street west onto Broad Street south as part of the Henry Aaron Loop encircling Downtown Mobile. Photo taken 11/23/14. Three lanes advance northward beyond Beauregard Street onto both Interstate 165 north & U.S. 90 east. Beauregard Street west carries the Truck route for U.S. 98 west toward Spring Hill Avenue while tieing into the Alabama State Docks just to the east. Photo taken 11/23/14. An off-ramp quickly departs from the beginning of Interstate 165 for a Conception Street Road. This ramp was formerly a part of the U.S. 43 mainline, before the bridge over the adjacent state docks railroad tracks was demolished. U.S. 43 ends just east of I-165 along U.S. 90 (Bay Bridge Road). Photo taken 11/23/14. See the Water Street section of the Mobile City Guide for more photos from this perspective. U.S. 90 (Beauregard Street) eastbound at Water Street south and Interstate 165 north. U.S. 90 joins the northbound freeway to Bay Bridge Road (Exit 2) as it continues east into Baldwin County. Photo taken 11/25/14. Additional photos from this perspective posted at the U.S. Highway 90 East (Mobile County) highway guide. Beauregard Street west leaves the Alabama State Docks and Dekle Street to meet Interstate 165 north & U.S. 90 east at Water Street and the GM&O Transportation Center. U.S. 90 west follows Beauregard Street onto Broad Street south to Government Street. with Photo taken 07/17/07. “Interstate 165 opens today, completing state’s system.” Mobile Register, October 28, 1994. “I-165 now open Route connecting downtown with I-65 in Prichard saves motorists 9 minutes in travel time.” Mobile Register, October 29, 1994. Page updated November 30, 2015.